The 2008 Chicago Bears lost several games in maddening fashion, games that came back to haunt them when it came down to it at the end of the season. In 2007, the Chicago Bears were coming off a Super Bowl appearance and were roundly expected to win their third consecutive NFC North title, make the playoffs and contend for another NFC Conference championship. They responded by regressing horribly on defense and seeing how the "real" Rex Grossman played when the cards were down. That year, the Bears finished 7-9, far below expectations. During 2008's training camp at Bourbonnais, IL, the Bears seemed to be back to their usual "us vs. the world, we're the only ones that believe" attitude. In interviews with local radio stations, players predicted at least that the team would surprise dissenters, and potentially that the playoffs were in the team's immediate future. In as roller coaster of a season seen in Chicago at any time since 2001, the 2008 Bears did indeed have plenty of surprises in store for onlookers. They would shock the league with an opening-day upset, and then drop two in maddening fashion. They rebounded to win two, then lost the most maddening game of the season. While continuing to win games they should have in an easy schedule, they were manhandled by division opponents when it really counted. In the end, the players did have the right to claim a better season than most expected, but the title of "better than people thought" wasn't enough to earn them a berth in the postseason. It went down to the wire-with help from other teams and their own win the Bears might have made the playoffs in 2008, but it didn't happen. The Bears dropped their final game of the season to finish 9-7 and missed the playoffs for the second consecutive season. The 2008 offseason began with members of the Bears and their fans watching the archrival Packers winning their way to the NFC Championship Game after finishing the regular season with a surprising 13-3 record. Perhaps the only positive in the Bears' 7-9 record was the fact that Chicago did hand Green Bay two of their three losses. It seemed if nothing else, the Bears could count on Lovie Smith beating the team from Wisconsin. It was commonly thought the chances would be even better when longtime Packer quarterback Brett Favre announced his retirement in March after 16 years of usually dominating the Bears. Chicago had plenty of work to do this offseason-at virtually every position on the field. Areas of the team that seemed like strengths just a year before now needed major attention. Additionally, distractions abounded, none more potentially devastating than the one featuring their star player. Middle linebacker Brian Urlacher, the face of the franchise since his rookie year in 2000, was threatening a holdout or retirement if the terms of his 2003 $59 million contract were not restructured. The Bears eventually relented in July, handing Urlacher a $6 million bonus and potentially $18 million in new money with an extension, trusting that the hard-hitting Urlacher they saw late in 2007 was the guy they were paying for and not the sluggish, dinged linebacker of the early part of that season. Time would tell. Urlacher was just one of the many veteran players the Bears decided to lock up over the offseason prior to the 2008 campaign. Kicker Robbie Gould signed the most lucrative contract for a kicker in NFL history. Tight end Desmond Clark was extended, as was Alex Brown, proving the foible of his benching in favor of Mark Anderson in 2007. In June, defensive tackle Tommie Harris received a four-year, $40 million extension. And during a free agency period that Lance Briggs attracted surprisingly little attention, the Bears were able to re-sign their other linebacking star to a six-year, $36 million deal. In the flurry of re-signings, the Bears were not able to secure the services of one player, that being wide receiver Bernard Berrian. The Minnesota Vikings made a fast move for Berrian, acquiring his services for six years to the tune of $42 million. This for an oft-injured player with questionable hands during his tenure with the Bears. Some criticized Bears General Manager Jerry Angelo for not using the franchise tag on Berrian, a move that would have assured the Bears' being able to keep the receiver for one year at approximately $7 million, a move that may have been smart given their dearth of talent at the position. A gap in talent that was extended when veteran Muhsin Muhammad was released. Another addition by subtraction occurred when safety Adam Archuleta was released. The Ram and Redskin castoff played one terrible season in Chicago, costing the Bears a sixth-round pick, over $5 million, and promising young safety Chris Harris as he was traded to Carolina after Archuleta's acquisition. While all of the former transactions were going on, the Bears, as always, had to figure out their quarterback situation. In 2007, Rex Grossman entered the season after taking the Bears to the Super Bowl via one of the team's better quarterback seasons in its history. Grossman faltered in the season's first three games, then gave way to Brian Griese, who started the next six games. Griese was injured, then Grossman played stronger as he started the next four games. After Grossman was once again injured after 4 more starts, former starter turned third-stringer Kyle Orton started the final three games of the season. Angelo quickly re-signed Orton to a modest two-year contract, and Grossman for just one more season, and Griese was traded to the Buccaneers in March. Following the signings, Smith announced there would be an open competition at quarterback in training camp, perhaps for the first time in Chicago since 1999. Angelo was quick to remind observers that free agency for the Bears in 2008 meant re-signing their own players, so it was no surprise when the Bears made no major moves during the period during which teams usually fill holes. Chicago did sign receivers Brandon Lloyd and former Bear Marty Booker, giving the Bears perhaps the most dubious receiver corps in the league. Also unaddressed were major issues on the aging offensive line, especially after the underachieving Fred Miller was released. In the 2008 NFL Draft, the Bears held the 14th overall selection in the fourth round. They also owned an additional pick in the third round from a 2007 trade with San Diego, and were able to move up from their third-round selection to San Francisco's when the league penalized the 49ers for alleged tampering with Lance Briggs. The Bears were roundly expected to select an offensive tackle with their first round pick, and also figured to need a running back to team with the questionable Cedric Benson, a wide receiver, defensive tackle and defensive backs. Chicago was thankful when their coveted choice, Vanderbilt's Chris Williams, fell to them. In selecting Williams, they left the other first round tackles Branden Albert, Jeff Otah, Gosder Cherilus and Sam Baker on the board. In the second round they picked running back Matt Forte from Tulane in a move they hoped would motivate the slumping Benson. With their third-round picks they selected defensive tackle Marcus Harrison and receiver Earl Bennett. With their remaining picks the Bears selected a guard, two defensive backs, a tight end, two defensive linemen, a linebacker and a wide receiver. Six of those eight picks would make the team. Minicamps and offseason activities for the '08 Bears were eventful mainly because of one reason: Cedric Benson. Benson was first arrested in May on a boating while intoxicated charge levied in his college town of Austin, TX. After allegedly refusing to cooperate with the arresting officers, Chicago's starting running back was pepper-sprayed and hauled away. After acquiring a high-profile attorney and screaming his innocence in this matter, Benson was again arrested on a DUI charge just 5 weeks later. Following the second arrest, the Bears cut Benson, naming rookie Matt Forte their starter before he was even signed to a contract. Thus ended the Bears career of the player the Bears made the fourth overall selection of the 2005 draft, and for whom successful back Thomas Jones was offloaded. So in July, the Bears reported to their summer headquarters at Bourbonnais, resuming their "with us or against us" cries. Camp opened with the announcement that all-world returner and mediocre receiver Devin Hester was a holdout and would not report without a renegotiation of the remaining two years on his contract. Within days Hester would return after being allegedly being fined $30,000, and three days later it was announced he received a four-year contract extension worth up to $40 million with incentives heavily tied to receiving statistics. Following a 1-3 preseason during which their defense was shredded by first-through-third strings of the opponents, most analysts picked the Bears to finish anywhere from 4-12 to a high of 8-8 or 9-7 on the year. Orton was named the starting quarterback after neither he nor Grossman looked like an NFL quarterback, and Angelo cut his second and third-round picks from the previous season in defenders Dan Bauzin and Michael Okwo. It was hardly a preseason that inspired confidence in the 2008 Bears, especially when top pick Williams went down with a back injury in his very first practice, and defensive tackle Harris continued to be slowed by nagging injuries. These developments brought into question Angelo's practice of drafting players that had been taken off other team's boards due to injury concerns. The Bears traveled to always-powerful Indianapolis for a Super Bowl 41 rematch, and very few predicted that the Bears would have a chance. They responded with the biggest upset of the week, beating the Colts 28-13 behind a remarkable debut by Matt Forte and a strong defense. Granted, the Bears were helped by the fact that Colts quarterback Peyton Manning was coming off a serious knee injury and their hosts looked generally disorganized, but nevertheless it was a strong start to the season. The Bears followed up the opening day road upset with their first of what would be three maddening losses on the season, the first happening at Carolina on September 14th. The Bears led 17-13 in the fourth quarter on a scorching day, but after failing to convert on a fourth-and-1 with less than two minutes remaining, the Panthers drove the field to win the game. Further frustrating on this day were two fumbles by tight end Greg Olson and Orton missing a wide-open touchdown pass. The following week the frustration quotient was increased when the Bears hosted the Buccaneers in their home opener, when the Bears wore dark jerseys in their home opener for the first time since 2004 (thankfully). Again, the Bears led 24-14 in the fourth quarter, but a relentless Tampa offense led by Bear castoff Griese shredded the Bear defense late in the game. Griese would attempt 68 passes on the day, and late in the contest his receivers came open time and time again over the middle, hitting every hole in the Chicago cover two scheme. Tampa would eventually tie the game 24-24 at the end of regulation. 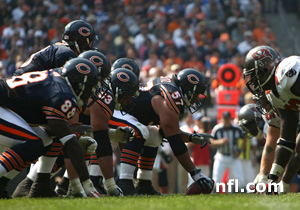 Overtime began with the Bears forcing a Tampa punt. On Chicago's possession, receiver Rashied Davis dropped a perfect first-down pass at the Tampa 35, one of many drops that would hamper the newly re-signed Davis in 2008. Then came the play that would be remembered far beyond 2008 in Chicago. The Bears defense rebounded, pinning the Buccaneers at their own 10 and apparently forcing them to punt. But at the end of that third-down play, cornerback Charles Tillman launched himself into a pile, retaliating after Buc tackle Jeremy Trueblood allegedly took a swing at a Bear. (Trueblood would later claim his ahem, manhood was attacked by a Bear in the pile.) Tillman was flagged for 15 yards, and the Bear defense then collapsed. Tampa drove the field, kicked a field goal, and defeated the Bears 27-24. Chicago was 1-2. But then in this roller-coaster season, the maligned Bears defense stepped up the following week on Sunday Night Football, beating an Eagles team missing Brian Westbrook 24-20. The game featured a monster goal-line stand by the Bears defense, and the entire 11-man unit was named "Horse Trailer Player of the Game" by the NBC crew covering the game. After upsetting the Eagles, the Bears were back in the hunt, taking care of the lowly Detroit Lions 34-7, moving their record to 3-2. At the same time, Orton was getting noticed as a bona-fide NFL quarterback, a term not used near a signalcaller from Chicago in several decades. But again, just when it seemed the Bears were headed in the right direction, they faltered in disgraceful fashion. At Atlanta on October 12, Chicago went down 19-13 late in the fourth quarter, and it looked as though the Bears would lose. But Orton directed the Bears on a legitimate game-winning drive, hitting Davis on a 17-yard pass with just 11 seconds remaining in the game. Sure thing, right? Wrong. The Bears squibbed the ensuing kickoff, then allowed the Falcons to complete one quick pass for 26 yards with one second remaining in the game. Falcon kicker Jason Elam then calmly nailed a 48-yard field goal, and for the third time in 2008, the Bears snatched defeat from the jaws of victory. The Bears did rebound from the Falcon loss that dropped them to 3-3 with a crazy 48-41 victory over the Vikings in Chicago. Orton had the game of his career when he threw for 283 yards and two touchdowns, special teams added two more touchdowns, and Forte one. The following week versus Detroit, Orton injured his ankle, and Grossman replaced him for the next game and a half. Grossman looked like the Grossman of 2007 in his 2008 opportunity, solidifying his exit out of Chicago following the season, and the Bears lost to the undefeated Titans after narrowly beating the winless Lions. For the remainder of the 2008 season, the Bears would win the winnable games, but dropped the games that counted. In November, the Bears played two games that they and their coach announced publicly would define their season. And they lost both. In the first at Green Bay on November 16th, the Bears were manhandled 37-3. Chicago's defense sold out to stop Aaron Rodger's passing, then were killed by the Packer rushing attack. The Packers would falter in their own right, however, leaving the Bears and Vikings to battle for division supremacy at the Metrodome November 27th. The Bears jumped to a 7-0 lead and looked poised to move the score to 14-0 when they had first and goal inside the Viking 5. But another goal line stand would doom the Bears-just as one did at Carolina and Atlanta. When Forte couldn't push the ball in on fourth down, the Bears figured they still had the Vikings pinned at their 1. But on the very first play from their one-yard line, Viking quarterback Gus Frerotte hit a wide-open Berrian for a 99-yard touchdown pass, after Tillman blew his man coverage. The score blew the game open in the Vikings' favor, and Minnesota would go on to win 34-14, basically taking an insurmountable lead in the NFC North division that night. Following the loss to Minnesota in November, the Bears still had a minimal chance of making the playoffs with help from the Vikings. The Bears did win 3 of their last 4 games in dramatic fashion, but lost with the season on the line at Houston. Had they won, due to an improbable Oakland victory at Tampa and a Dallas loss at Philadelphia, the Bears would have squeaked in as the wildcard team with a win. But alas, because the Bears couldn't take care of their own business, it was not to be. In a year in which Chicago saw their other favorite team, the Cubs, favored to win the World Series only to choke in the end, it was no shock to see the Bears choke away their chances as well. Quote of the Year: "Everything is falling the Bears' way right now except for the Bears taking care of their own business." Fox commentator JC Pearson on how the Bears might have made their way into the playoffs, until they couldn't win their final game at Houston, despite jumping out to a 10-0 lead. The Bears would have made the playoffs as an NFC wildcard team if they would have won, but they didn't. Take every win we can. Passing: Kyle Orton- By Chicago Bears quarterback standards, Orton's season was great, but Bears' QB standards aren't high as we know. Orton threw for 2972 yards, 18 td's with 12 int's, and had a QB rating of 79.6, not great but not terrible. Rushing: Matt Forte- Forte would have garnered serious attention for rookie of the year if not for the likes of Matt Ryan and Chris Johnson. Forte rushed for 1,238 yards and 8 td's with a 3.9 yard average. Receiving: Matt Forte- Forte also led the team in receptions, finishing with 63 receptions for 477 yards and another four scores. Scoring: Robbie Gould- Gould was overall solid again on field goals (26/29) and extra points (41/41), leading the team with 119 points scored. Sacks: Alex Brown- Brown led the team with 6 sacks in a historically bad year for the Bears passrush. The team totalled 28, 2nd worst team total in 30 years. Interceptions: Kevin Payne- The Bears finished third in the NFL in interceptions, and Payne led the Bears with four in his first year as a starter. Left to Right: Offense Kyle Orton, Matt Forte, Jason McKie, Rashied Davis, Devin Hester, John St. Clair, Josh Beekman, Olin Kreutz, Roberto Garza, John Tait, Desmond Clark, Robbie Gould. Defense Alex Brown, Tommie Harris, Dusty Dvoracek, Adewale Ogunelye, Lance Briggs, Brian Urlacher, Hunter Hillenmeyer, Charles Tillman, Kevin Payne, Mike Brown, Corey Graham, Brad Maynard. Chicago Bears Head Coach Lovie Smith was on top of the world in late January 2007. The team he took over in 2004 as one of the lowest-paid head coaches in the NFL was in the Super Bowl, and a lucrative extension was surely on the way. Even following the Bears' loss in Super Bowl 41, the public demanded for Smith to be retained, and shortly thereafter Smith, along with GM Jerry Angelo and team President Ted Phillips received contract extensions. Smith is signed through the 2011 season at a salary of around $5 million per season. Then shortly after signing the extension, Smith dumped popular defensive coordinator and former Bear linebacker Ron Rivera in favor of elevating friend and longtime associate Bob Babich into the role. As we all know now, the Bears defense took a nosedive in production in 2007. They rebounded at times in 2008, but still were totally gashed much too often. Smith and both of his top assistants, including offensive coordinator Ron Turner, continued to take serious heat during the 2008 season when both the offensive and defensive units struggled. Fans at time even called for Smith's head, something that is sure not to happen while he has a guaranteed contract for three more seasons. It would be unfair to call Smith a bad coach. After all, he did take the Bears to the Super Bowl for the first time in 21 seasons. On the other hand, Smith has a way of speaking in an aloof and at times condecending way, which certainly doesn't endear him to the fans or the media. Whether Smith will stay to finish the full five years of his extension is unknown at this point, but should the Bears show serious cracks in their commitment and execution as they did at times in 2008, the hotseat will certainly become hotter for Smith, Babich and Turner. Matt Forte was drafted by the Bears in the second round from Tulane, the Bears hoping he would push the dissapointing incumbent Cedric Benson. We know now that Benson was cut after several legal altercations, and all Forte did was lead the NFL in touches, percentage of team's touches, and set the Chicago Bears record for total yards and rushing yards by a rookie. Not a bad player to build on for the future. In 2008, the Chicago Bears decided to focus on re-signing and rewarding their own players rather than spending big money for new free agent acqusitions. At different points in the offseason, the following players would secure new and lucrative contracts from the Bears: Brian Urlacher, Kyle Orton, Rex Grossman, Rashied Davis, Tommie Harris, Alex Brown, Desmond Clark, Tommie Harris and Robbie Gould. In May, running back Cedric Benson was first arrested for boating while intoxicated, then just five weeks later again for driving under the influence after the Bears had warned him to be on his best behavior. GM Jerry Angelo cut ties with Benson immediately following the second arrest. By that point, Benson had earned his guaranteed money of over $15 million dollars and the additional opportunity cost to the Bears was the trading of the productive Thomas Jones. The Bears cut receiver Muhsin Muhammad and lost Bernard Berrian to free agency. In return, the Bears signed the puzzling Brandon Lloyd and brought back well-worn Marty Booker, to be joined by holdovers Rashied Davis and the Devin Hester project. Lloyd alternated strong play and amazing catches with weeks of inactivity and strange absences. Davis was re-signed in the offseason, but dropped more passes on the season than can be remembered in recent memory. Hester remained a project, not much more through the 2008 season. Additionally, Hester regressed as a returner in a big way, eventually being benched on kickoff returns late in the season in favor of Danieal Manning. Manning delivered strongly on kickoff returns, taking one back for a touchdown in the critical late-season victory over the Saints. Angelo released two of his top four 2007 draft picks in the final cutdown of 2008, when he launched defensive end Dan Bazuin and linebacker Michael Okwo. This left running back Garrett Wolfe and tight end Greg Olsen as the two remaining players of the first four picks. Olsen continued to help give the Bears a strong one-two punch at the position, but while Wolfe emerged as a stong special-teamer, he still has not lived up as a third-round pick at running back. Keeping in mind that in 2004, the Bears selected linebacker Leon Joe when they could have picked another little-known Northern Illinois running back, Michael Turner. Instead of picking Turner, now a top running back in the NFL, the Bears wasted a pick on Benson the following season, then took Wolfe too high in 2007. The San Francisco 49ers were ordered by the NFL to swap third-round picks in the 2008 draft with the Bears after Chicago accused them of tampering with Lance Briggs while he was under contract. The '08 Bears defense was wildly inconsistent, as was every other aspect of the team. They looked in the opener to be the Bears defense of old when they upset the Colts, then they went on to break down most games, usually in their pass defense. The unit could usually shut down the run, but when they did so they had to sell out so heavily they were gouged through the air. Several long time defenders were replaced in the lineup by season's end. First linebacker Hunter Hillenmeyer was replaced by newcomer Nick Roach. Then through injury and lackluster play, cornerback Nathan Vasher lost his starting role to second-year player Corey Graham. Defensive Coordinator Bob Babich developed what looked to be a signature of his defense in 2008, quite often crowding the line with all three linebackers. One, two or all linebackers could either blitz, or would frequently drop back into coverage at the last minute. After using the look heavily early in the season, Babich seemed to ease up on it when teams began gouging the Bears' pass defense, but the look never disappeared entirely. Kicker Robbie Gould had another strong season for the Bears, finishing by converting 24 of 27 field goal attempts while being perfect on extra points. Unfortunately his only onside kick try of the season at Houston in the critical final game was horrible. Punter Brad Maynard, who has never made a Pro Bowl, again had an unbelievable season, leading the league in punts placed within the opponent's 20 yard line. As maligned as they were on defense, being shredded in the final game that would decided Chicago's season, the Bears still led the league in takeaways.